The radio personality, Gareth Cliff, and broadcasting giant, M-Net, are battling it out in court. Follow live updates from court here. Court has been adjourned. Judgment will be given before 10:00 on Friday, 29 January. Advocate Dali Mpofu responds perhaps one last time as sighs ring out from the gallery. It’s been a long day for many. Advocate Dali Mpofu stands up with the open constitution in his hand. He looks determined. A quick turn around and the M-Net CEO is frowning, scowl on her mouth. Gareth Cliff sits back in his chair, feet crossed, as he watches proceedings. M-Net: Takes exception to comments made by Dali Mpofu about “white supremacy”. M-Net cannot hire someone who insults them. Advocate Dali Mpofu has concluded his remarks and the court will now hear from M-Net. Dali: M-Net employed Gareth because he shocks and would bring in viewership numbers. They often rode on his controversy. Dali: The only reason why M-Net hired him was because he is controversial. It is strange that they were happy to use the face of this so called "racist" on promotional materials for the new season until we asked them not to. Mpofu said had Msengana and Mpofu tweeted what Cliff had, which is “People don't understand freedom of expression”, the matter wouldn't have made it to court. "We wouldn't even know about it,” Mpofu said. Dali: We can’t say people can be allowed to make dangerous comments and only punish when Gareth Cliff mentions freedom of speech. Dali: Their positions were arguably perceived to be worse than Gareth Cliff, but he is sitting here. Dali: Somizi’s comments were also perceived to be racist. You cannot have it both ways. We are not saying that Somizi and Unathi should be fired. We are saying well done for retaining them, and you should retain us. Dali: M-Net’s statement reads that they had decided to include him and then stated that they no longer were going to include him. Dali: Why should Gareth Cliff remind them of the contract at every chance and meeting when it is known that there is an agreement? Advocate Dali Mpofu: This may as well be an unopposed application. Advocate Dali Mpofu says that claims that M-Net and Gareth Cliff’s relationship has soured beyond repair should not in any way affect reinstatement. Dali: The bottom line is that , like in the Santos case, Gareth Cliff should be reinstated. According to advocate Dali Mpofu, Gareth Cliff has 1.2 million Twitter followers and it is highly likely that every now and again some of them may take offence with what he tweets. Dali: M-Net perceive that Gareth Cliff is racist because of an unpopular view. Policy can’t be swayed by flimsy views of 5 people. Advocate Dali Mpofu says freedom of expression is a tolerance of an alternative or unpopular view. Dali: Freedom of expression is the right to offend, by definition. Dali: M-Net must try and terminate Gareth Cliff’s contract after 1 week of reinstatement. “They must try it!" Dali: The termination of Gareth Cliff’s contract was done in bad faith. Dali: If M-Net terminates Cliff's contract after 1 week, the court must ask for reasons for his departure and must scrutinise it fully. Gareth Cliff sneaks a long glance, and a tiny smile, to his friends on the 2nd row of the gallery. Dali: We are not asking for Gareth Cliff to be reinstated for years, only to the position where he is equal to all the other judges. Dali: Gareth Cliff must be returned to his position given in the agreement. Dali: All of the high profile statements made by politicians calling him a racist, were given after Gareth Cliff dismissal from Idols. Dali: They fired Gareth Cliff because of the incorrect and absurd perception that he is a racist. Where have they established the facts of the public perception of Cliff. There is only 5 tweets calling for Gareth Cliff exit . Even the EFF statement proves the point. Mpofu says Gareth’s only offense is sending the tweet that stated that people do not understand freedom of expression. Gareth Cliff gives off a little laugh as the judge Nicholls clarifies whether he can only be reinstated for 1 week. Advocate Dali Mpofu will now respond to the arguments made by Trengove (M-Net). M-Net finishing their argument: We ask that application be dismissed with costs. 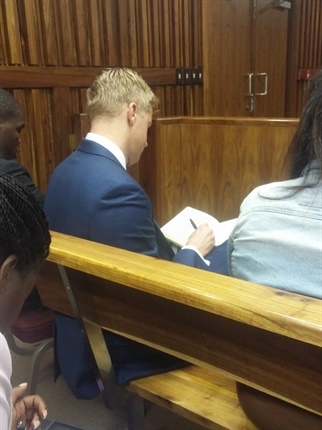 Gareth Cliff sitting in the front row taking notes. Trengove: "It is absurd to say that you have to accept me regardless of my reputation... because I am entitled to say what I want." While Cliff was suing M-Net for defamation, Trengove said Cliff was the only one to blame for his tarnished reputation. Trengrove told the court that indeed, Cliff had the right to say whatever he wanted but he did not have the right to be an Idols judge. Trengove makes reference to Oscar Pistorius case. Says in Oscar case sponsors exercised their right to terminate their contracts with him because of his damaged reputation which had the ability to tarnish their brand. M-Net have the right to decide on whether they wanted Gareth Cliff as a judge and they don’t. M-Net: Gareth Cliff can’t claim a contractual right to be an idols judge for years to come. M-Net remain certain that Gareth Cliff did not have a contract with them. M-Net: Technically Gareth Cliff is only entitled to be a judge for a week because M-Net can cancel a contract at any time with a week's notice. M-Net: Doesn't it show in Gareth Cliff’s conduct that he did not sign a contract. Only after meeting his attorney, did his story change. M-Net: The station’s first response that they were reviewing Cliff’s contract was not challenged by Gareth Cliff. His public utterance after the meeting showed that he had resigned himself to the fact that he would no longer be part of the show. M-Net: Cliff's agent also never replied stating that they were in fact accepting the offer. M-Net: Confidence in signing a contract is not a contract in itself.